I am very interested in starting a worm farm specifically to dispose of dog poop (I have access to A LOT on a weekly basis) in a more environmentally friendly way than just tossing it in the trash. However, I have a couple of questions; 1) how smelly would this be say if the farm was set up in my backyard, will it attract flies and other undesirable pests? 2) roughly how long does it take to breakdown? and finally 3) how often can I add the food (ie. dog poop)? On another note, I just want to add thank you for putting this site together. It is filled with tons of useful information. Glad I could help Jennie! Thank you for the information. I have 5 dogs and nobody wants to pick up dog poop and I have no good excuses for the kids to help out with that chore other than it just has to be done. Now I can tell them if they want to eat they pick up dog poop and feed the worms. This information solved several problems in my house. Thank you again. first of all thank you for the compliment! It is always nice to get some acknowledgement for the hard work that went into the side. I can only encourage you to get your dog poop worm bin of the ground. It is really not difficult and very rewarding. 2. Flies do get attracted to fresh dog poop especially in summer, as they like to lay their eggs into the poop so their larva can grow. However there are a few ways to prevent the flies from producing lots of maggots in your worm bin. A) Collect the dog poop before the flies get to it and place it straight into your worm bin, which should have a tight fitting lid to prevent flies from getting inside. B) Collect dog poop that has been dried out by the sun which doesn't smell anymore and any maggots inside it would have died. 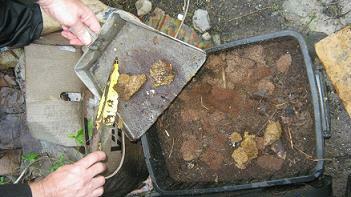 C) Collect your dog poop, place it in a small bucket and pore some boiling water over it. Any maggots inside will be killed. But seriously we really don't have problems with flies near our dog poop worm farms. 4. The amount of dog poop you can add depends of the amount of worms you got in your bin. Under ideal conditions you will be able to add dog poop on a daily basis to your worm bin.